Summary: The aftermath of last week’s shocker yields a thoughtful exploration of grief and death, what it means for the characters, and how it paves a new path for the future. 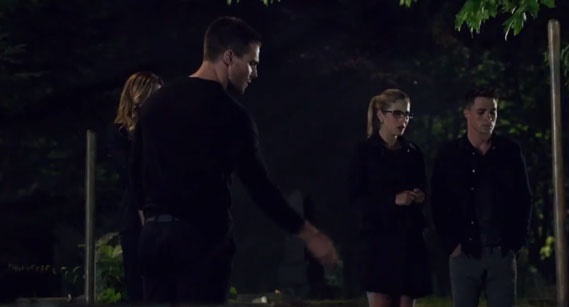 After Sara’s death, Team Arrow sets out to catch the archer who killed her. After Lance calls the Arrow when another archer appears in town and starts skewering businessmen, the team have their suspect. Diggle uses A.R.G.U.S. to find the archer’s identity; he is a man named Simon Lacroix, who goes by the codename Komodo. Laurel is helps track them down, but is when they find out Ray Palmer will be Komodo’s next target, Laurel arrives on the scene ready to kill him. Oliver stops her, but not before they discover that Komodo was not in Starling when Sara was murdered, and his arrival now is, in fact, a coincidence. Ray Palmer pursues Felicity, and after realizing how much more she wants for life because of Sara’s death, she decides to take him up on a job offer. Laurel plans to tell her father the truth about Sara’s death, but upon being reminded of his condition, she decides to keep it a secret. Oliver begins to worry that he hasn’t heard from Thea, which forces Roy to tell him the truth about why she left town, prompting Oliver to decide to find her. We learn that she is with Malcolm, has been training to fight, and calls Malcolm “dad.” In the flashback, Maseo tells Oliver that Amanda Waller has ordered his first kill: Tommy Merlyn, who has come to Hong Kong in search of Oliver after learning his e-mail was accessed. 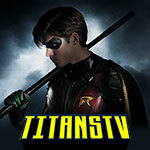 Oliver and Maseo concoct a plan to “kidnap” Tommy and convince him that it was a ruse to ransom him for money, successfully getting him out of Amanda Waller’s hair. “The Calm” seems even more like a standalone after seeing “Sara,” which focuses squarely on that pivotal final scene without doing much with the premiere’s other developments. That’s probably a good thing, as the best and worst part about “The Calm” was its state as more of an epilogue to season 2 rather than the start of a new story. Even in “Sara,” there isn’t much indication for what this season is setting out to do in the long run, but it attacks the present issue much better than “The Calm” shakily addressed its relationships. The fear of killing off such an important and beloved character as Sara is that it can easily feel manufactured for the shock. It very much did at the end of “The Calm,” being rather tacked-on to the end as a cliffhanger. And there are points of “Sara” that teeter on the edge of feeling inorganic, particularly when tossing not-so-subtle anvils about Laurel taking up the Canary mantle. 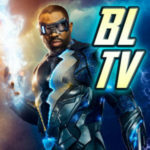 Those moments are minimal, luckily, as the episode circumvents a strict “tragic superhero origin” or “angry rampage” by branching out and exploring numerous aspects of grief and death, almost exclusively between Laurel, Felicity, and Oliver. To be expected, Laurel’s grief is a massive part of the episode, though not nearly as overbearing as it could have been. While Sara’s death will surely affect Laurel most in the long term, “Sara” is smartly focused in her immediate reaction. In this case: anger, pure and simple. Laurel wants revenge, and while Katie Cassidy still doesn’t have her claws in the character as well as she should after two years, she’s on the upward swing this week. Cassidy is much better when Laurel isn’t very nuanced; there’s shades of Supernatural‘s Ruby during her interrogation in the hospital, where she’s particularly fun. There are still some poorly written moments for her, like her extremely dumb decision to walk right up to the hole were an arrow just came through and killed a man to stare at the assassin who is still standing right there. And Cassidy isn’t as good during her face-off with Komodo, where she has some awkward line delivery. But this is still a better episode for Laurel overall, and Cassidy is generally solid in any scene depicting Laurel’s grief, helped by how much time last season was spent building up Laurel and Sara’s sisterhood. For a character who had a problem of making things too much about herself last season, Laurel certainly has a right to do it this time around. For example, no one comments on the trauma of a blood-soaked Laurel carrying and probably dragging her sister’s corpse, who she just saw brutally murdered, all the way to the Arrowcave. That’s a horrific thing for someone to endure, and that Laurel keeps as calm as she does is admirable. Last season suggested that everyone has a crucible to endure before becoming a hero, and it’s clear that Sara’s death will be Laurel’s this season. It even compliments last season’s abysmal Drunk Canary arc, as Laurel comments on specifically not wanting to be in a bar to cope with with her grief, instead focusing her anger towards productive goals. It doesn’t totally justify that arc, but it gives Laurel a reason to be focused on helping Team Arrow, since wallowing in self-pity is thankfully not an option anymore. Her decision to keep it a secret from Quentin is frustrating, however, clearly manufactured more for dramatic potential rather than a normal human decision. Quentin as a character is like a ticking time bomb now, with his vague heart condition and the Aunt May-like fear that he’ll explode at any shock. The results might not be bad later on, but right now it all feels too artificial, in this case at the cost of Laurel’s development. It initially seemed strange for Felicity to be such a massive part of this episode’s grief exploration, considering she wasn’t terribly close with Sara. But it becomes clear that her place in “Sara” is that of a foil: Laurel is out for revenge and Oliver is doing the Arrow business, while Felicity actually reacts like a normal human being. The show has utilized Felicity’s naivete for both humor and pathos in the past, crafting some funny one-liners in regards to her lack of life experience, along with using her perspective to provide some of the show’s best pep talks. Felicity can’t be innocent forever, but so far her experiences are just enough below the tragedy of everyone else that she can still fit the role. The episode that featured Felicity and Sara bonding the most, “Time of Death,” heavily highlighted Felicity’s “normal human” status and the drawbacks that come with being in that position, and compared them to the tragic, hardened Sara. “Sara” does the same, but in a way that prompts development and change for Felicity rather than simply pointing out her unique perspective. 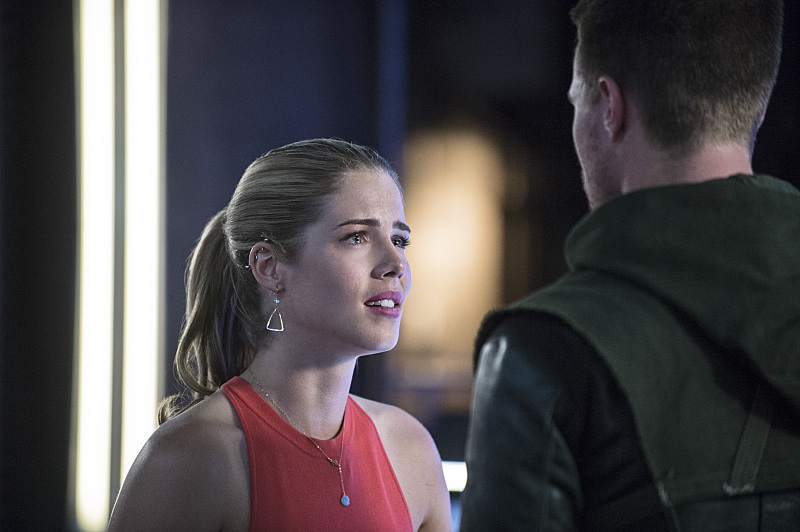 Of course, “unique” for Team Arrow is that Felicity is as upset as anyone could be when losing a friend. She cries, she calls out of work, she lashes out on people and immediately apologizes, and her spreading of the dirt on Sara’s grave is the only “traditional” contribution to the funeral. She’s the quintessential normal person dealing with grief in normal ways, and that makes her stand out from everyone else on this show, what with their torrid histories and lives already full of death and loss. Her reaction puts up a necessary mirror to the rest of the team, recognizing that, even in the face of so much death all the time, it can and should still profoundly affect them. For Felicity herself, though, Emily Bett Rickards gets her best material while cleaning up Sara’s corpse and, later, chastising Oliver. In the former, her monologue about Sara’s small hands—fantastic lines, so kudos Jake Coburn and Keto Shimizu—are devastating but wonderful reminders of these characters’ vulnerabilities. As for the latter, while Felicity’s tear-downs of Oliver got a little overbearing last season, they are definitely improved in “The Calm” and “Sara.” Felicity’s bits are the biggest connection this episode has to “The Calm,” actually, in that her realization that she “wants more than this” is pointed at both Team Arrow and her non-relationship with Oliver. Like one must move on from death, Felicity has to move on from the emotionally damaging state she’s been in. To be fair, taking Ray Palmer’s job offer doesn’t make a ton of sense on the micro level, unless it’s taken as an intentional jab at Oliver–which would be unfair, and irredeemably petty for Felicity to do, so let’s hope not. But on a macro level, taking on a new career and surrounding one’s self with new people is quite possibly the best way to move on from an old life, and the opportunity was certainly there for her to do it. Diggle isn’t part of the main trifecta (we’ll get to Ollie in a second), but it’s worth noting that he arguably provides the most important piece to Team Arrow’s grieving process: acceptance. In a way, naming his daughter Sara is the fresh grave Laurel begs for. This is the memorialization of her legacy, and it’s a better and more heartfelt way to honor her memory in the here and now than if Laurel immediately took on the Canary mantle. The episode makes it pretty damn clear that she eventually will, but for now, the Canary’s legacy isn’t what’s important—it’s Sara’s, as the title suggests. While “Sara” is more about the characters left behind, much as death is, the grave scene and Diggle’s part of it do a nice job highlighting how pivotal a character Sara was in the history of the show. Yes, unfortunately, she did deserve better. But it doesn’t look like her death will be in vain, considering it’s prompting a number of intriguing questions about the nature of the show. And of course, Oliver does what we’ve come to expect: be stoic and mission-oriented, something both Diggle and Felicity call him out on as being a problem. 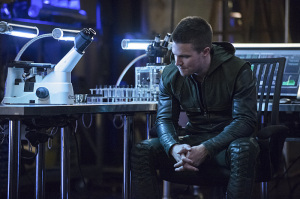 But it ends up being the most interesting journey of the episode because of Oliver’s final revelation. Oliver doesn’t ever break down and cry or make himself vulnerable, because that wouldn’t make sense for Oliver at this point. What he does is fully realize the stakes of his crusade. He always knew the stakes were high, but these first two episodes have seen the universe practically shoving this fact in his face. “The Calm” made it blatantly clear that dual life as The Arrow and Oliver Queen is a threat to the people around him, and only by devoting himself fully could he mediate that problem. And immediately after Sara’s death, Oliver suddenly becomes obsessed with reconnecting with Thea, the last piece of what he learned to fight for back in the first season, still thinking of the other people affected by his crusade. He has to keep it together for everyone else’s sake, because he’s the leader, the person they trust with saving everyone and the world. But by the end, the truth is apparent: Oliver is included in those stakes, too. The Arrow can die, much more easily and brutally than he perhaps thought. He’s human, and one tiny mistake would mean the end to everything he’s built. That’s something easily forgotten for a man who has faced death so many times in the last seven years, and it’s clearly something Oliver has not given as much thought to as his friends have. Stephen Amell does some of his best work as Oliver works through these facts this week, quite a feat considering so many of Oliver’s scenes rely on body language alone. That might be why Amell nails it, though; Oliver is constantly struggling to hold his facade together, but Amell purposefully communicates a huge amount of pain and frustration through only his eyes much of the time. Watching Oliver retrace Sara’s death on the rooftop is one of the most painful scenes of the episode, and it’s something that could only work with a performance as solid as Amell’s. But it’s with Oliver’s revelation that “I don’t want to die down here” that “Sara” makes its greatest achievement. Stephen Amell nails the line, carrying the weight of the entire episode in those seven words. Arrow has taken a slam-bang approach to storytelling since day one, and throughout the action and melodrama, it’s easy for these characters to forget their own vulnerability. 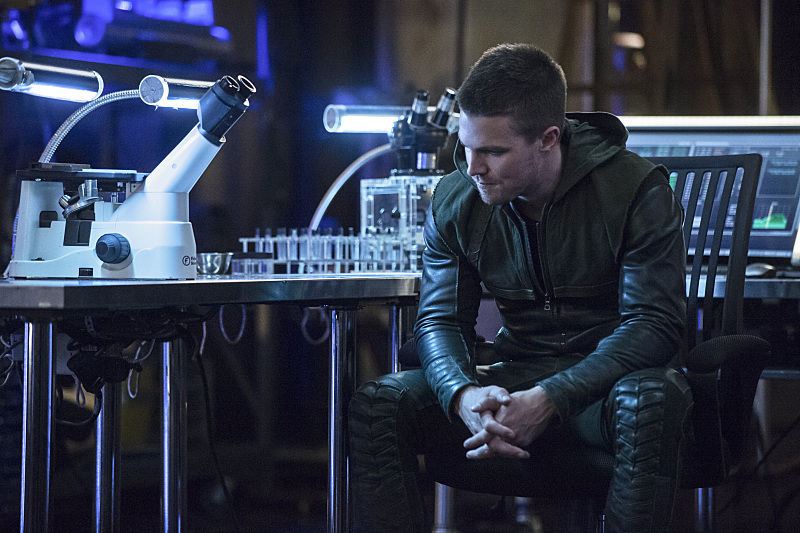 If Arrow has been about anything, it’s Oliver’s journey from machine to man, and that’s meant gradually exposing his emotional vulnerability over two seasons. “Sara” has him face his physical vulnerability, just a week after forcing him to face his human persona, which has our hero doubting himself more than ever. “Fear of death” probably won’t carry this entire season’s arc, but it is fitting considering this is happening as superpowers have been introduced a few cities over in The Flash. Recognizing one’s own humanness will be necessary the more that new world crosses over into this one, and it’s a hurdle Oliver will have to overcome. “Sara” succeeds by having everyone, not just Oliver, re-evaluate their lives because of Sara’s death: Oliver’s physical humanity; Felicity’s ability to move on; Laurel’s place in things; Diggle’s family; and Roy’s relationship with Thea. The best thing a “shocking” death can do is change things for the remaining characters and world, and while the changes here aren’t instantaneous, the whole of Team Arrow has been set on a new path to continue down for the season. There’s a new “My name is Oliver Queen” after all, this time specifically highlighting the significance of the friends in his crusade. Oh, right, Tommy was in this episode. Great as it is to see Colin Donnell back (and he slips right back into the role), the Tommy flashback is totally superfluous outside of Tommy-fanservice. Maybe there’s a theme about Tommy’s grief or something, but it’s too buried to leave an impact. So far, his brief appearance in “Three Ghosts” is superior. That said, could we say this flashback is the origin of Oliver’s gravelly Arrow-voice (minus the modulator)? While the nature of this story meant much of Laurel and Oliver’s “grieving” would be very TV show-y and not totally realistic or artful, I do appreciate Laurel’s stuffed shark story. Getting irrationally hung up on those little details about the loved ones is definitely something that happens. Colton Haynes isn’t given much to do overall, but there’s a tendency to have him at least be sort of the receptor to everyone. Roy is that other guy standing in the room for them to talk to, and he’s usually unbiased when it comes to most of Team Arrow’s arguments. Haynes is actually pretty good at it; he has no lines when Felicity talks about Sara as an Amazonian, but he coveys a great understanding and condolence in his facial expressions. Also, dramatic as it all is, I couldn’t help but laugh when he has to awkwardly walk away from Oliver’s “Okay,” followed by silence, like a child walking away from a disappointed parent. Even with so few lines, Haynes is great. Ray Palmer’s nerd speak is toned down—probably for the better—but Brandon Routh is as charming as ever. Laurel and Felicity working together is a good sight. Let’s get these ladies to be friends and have more scenes together, please? Arrow doesn’t do a lot of pop music, especially not in montage form, but “Courage or the Fall” by Civil Twilight and the montage with it fit the contemplative tone of this episode nicely. Lots of shows do that “sprinkling of dirt on a grave” thing without acknowledging it because it looks really dramatic (*ahem* Smallville…) so it’s nice that Arrow gives a little explanation. Matt Ward is another mostly throwaway villain as Komodo, but he seems fun in the couple of lines he gets, so hopefully he comes back. Oliver constantly bringing up that “Hey, Thea’s missing!” while searching for Sara’s killer seems to allude to Thea being involved, doesn’t it? Or is that purposeful, and it’s a red herring? Blake Neely’s score is particularly good this week, especially when Oliver and Roy are chasing down Komodo in Queen Consolidated. “There aren’t that many of us. Maybe ten that I can think of, most are in the League of Assassins.” We’re keeping you to that number, Oliver. “Why don’t you just go back to banging your pilates instructor, okay?” I’ve missed Tommy. “I know it won’t bring her back, she’s dead!” This is a dumb line in terms of real human speech, but I really like the self-aware subversion of the cliche. Like, she does have a point. Arrow has this way of making everything about Oliver, even when a given story is distinctly about someone else. That’s not, in any way, a criticism. It’s actually quite welcome and admirable, as so many hero shows often lose their main character in the shuffle in efforts to deepen their supporting cast. What makes it work even better on Arrow is that they can combine the focus without losing impact for either character. Sure, it’s a bit egocentric for Oliver to be caught up in worry about eventually giving his own life to this cause. All the same, it’s a touching reflection on Sara, their shared and similar histories, and a very honest moment rooted in character. What’s more effective about the episode is that it’s really about three people: Sara, Oliver, and Laurel. This was a catalyzing moment for Laurel, the biggest in a series of tragedies that pushes her toward destiny. Maybe it’s the expected and obvious choice to have her grief give her such pointed and fiery focus, but it’s the natural, right option. Thankfully received is Laurel not pushing Oliver and Team Arrow away in an overblow overreaction to their life getting her sister killed, even though, frankly, this life Sara and Oliver fell into and continue to pursue ultimately provided the opportunity for her to lose her life. Laurel embraces them and recognizes their loss as much as her own. One of the strongest aspects of the episode is the tension created by waiting for Oliver to explode, something he unexpectedly never does, even in that bracingly touching moment with Diggle in the foundry. It’s actually somewhat frustrating to watch, like awaiting the moment an overfilled coffee mug finally spills over the rim. The conversation with Felicity, Roy’s revelation about Thea, the rooftop crime scene, the funeral. Oliver had to believe what he told Felicity about needing to lead by not grieving as much as anyone. In addition to the emotion felt in Sara’s loss, that frustration gave a sufficient edge to the whole hour. It’s a bit hard to comment on the relevance of the HK flashback. Though it’s nice to see Colin Donnell and Tommy back, he has a rather thankless job here, as it comes off mostly as filling in a piece of history more than anything. Sure, Oliver works out a counter around Waller’s command, and he has to mask up for the first to lie to someone closest to him, both in protection of them and himself. It seems like I should’ve gleaned more meaning and connection to the present-day storyline, but it didn’t register much for me. Perhaps a rewatch or if someone would like to offer their take on it. Aside from the main attention placed on Oliver and Laurel, there are a number of good character moments for the supporting cast strung about. Ray Palmer’s vision for Starling City feels like more than just a plot device, and the briefest of looks on his face as he watched Arrow and Arsenal fight Komodo at the fund event pointed to a recognition of how he can serve in the future. Felicity’s existential crisis leading her to accept Palmer’s offer to work at Queen Consolidated again. Diggle being Oliver’s go-to for strength and support, as well as offering to name his daughter in memory of Sara. The tease at the end with Thea and Malcolm. The moments where all Laurel has to say to her father — henceforth to be known as Captain Q — is that Sara is dead but doesn’t. “Sara” the episode is ultimately about the impact of Sara the character’s loss on those closest to her. It’s, by no means, comprehensive, as the episode makes clear that this will have looming effects over this early part of the season, if not the whole year. In a way, she’s the most important character of the hour even though we barely see much of her. Laurel was right to declare that the boorish funeral and placing Sara’s body in her own, previously unused grave was undignified and too silent a remembrance. Yet, it was a stark reminder that this is where they all are in life right now. They can all accept that or try for something more. As an episode, it’s a step up from last week’s shaky beginning, a solid episode with emotional heft and resonance. Appropriately dark but offering a springboard for characters to pursue better futures, or at least strive for it. The fake-out with Komodo possibly being Sara’s killer but not compellingly offers no quick resolutions. Amell turns in a deft performance as Oliver navigates a razor’s edge of a fence on how he wants to react and should react to Sara’s death, starting from the moment he goes cold silent the moment he sees her body on the table in the Arrowcave. And Cassidy more than meets the challenge, delivering a Laurel who is broken but isn’t going to do nothing about it.